This is a slightly more closed pattern than my last design, Shells and Lace, but it is still lacy enough to let light through. The shell repeat is offset which I think makes for a prettier pattern. 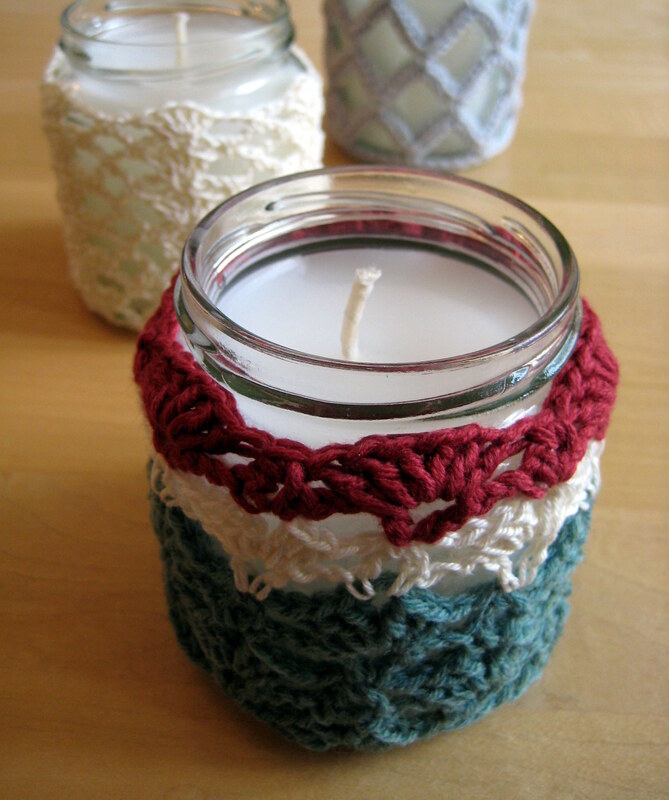 Look out for my open mesh jar cover pattern coming soon! It is best to make a quick swatch and then see what your own gauge is. 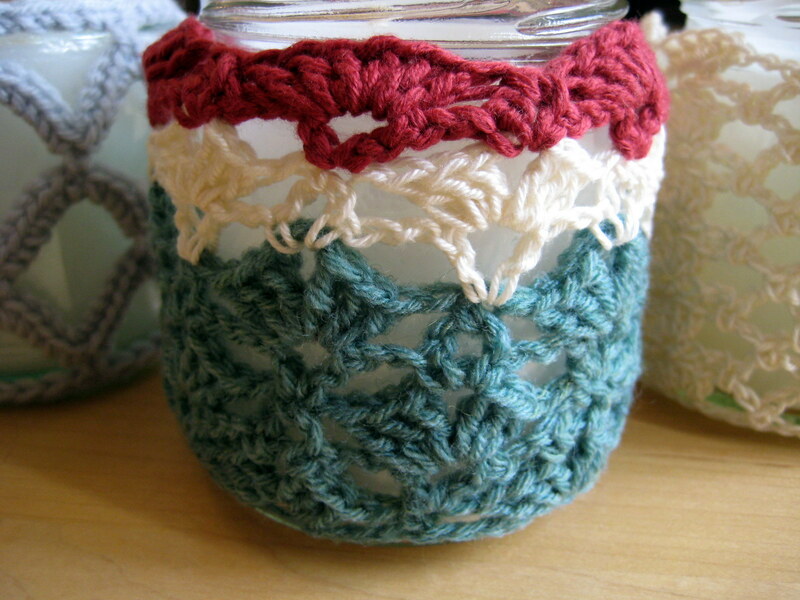 You can adjust the number of pattern repeats to match the circumference of your jar. This pattern is a little stretchy, so make it on the small side for a snug fit. If you make it too small you can always add a few rows of single crochet down the length and add some buttons as I did on my cover. 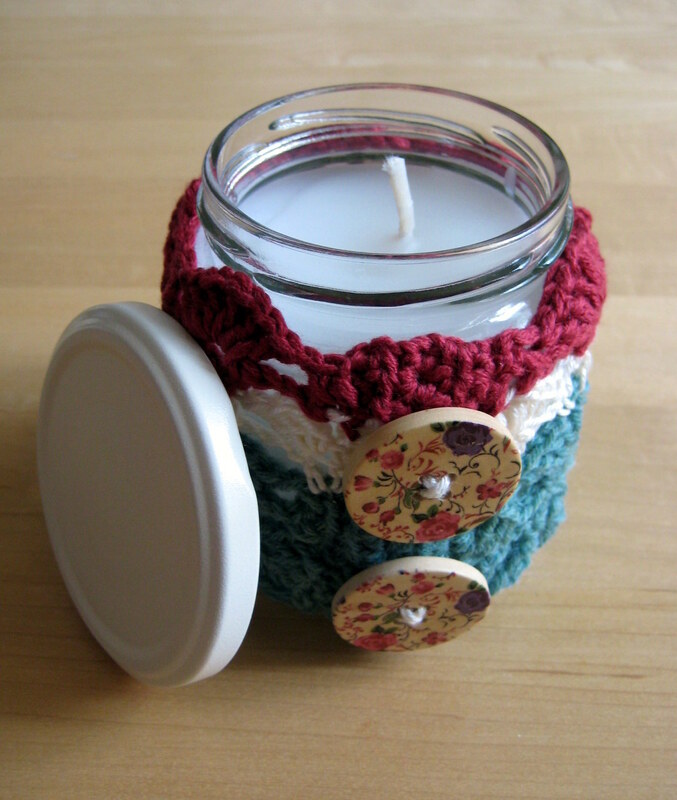 My jar was 24cm around, each pattern repeat was 4.5cm, so I did 5 pattern repeats for a 22.5cm cover. I then added rows of sc to add width! R1: sc in 2nd ch, *ch1, sk3 ch, (3dc, ch2, 3dc), ch1, sk 3 ch, sc, repeat from * to end, ending with an sc in the final ch. R2: ch3, turn, dc in sc, *ch2, [sc, 3ch, sc] in ch-sp between dc groups, ch 2, (dc, ch1, dc in next sc, repeat from * to end, ending with 2dc in last sc. R3: ch4, turn, 3dc in top of 1st dc, *ch1, sc in ch3-sp, ch1, (3dc, ch2, 3dc) in ch1-sp, repeat from * to end, ending with a (3dc, ch2, dc) in last of turning chains. R4: ch3, turn, sc in ch-sp, *ch2, (dc, ch1, dc) in next sc, ch2, (sc, ch3, sc) in ch-sp between dc groups, repeat from * to end, ending with an sc, ch2, sc in last ch-sp. R5: ch1, turn, sc in ch-sp, *ch1, (3dc, ch2, 3dc) in ch1-sp (between dc groups), ch1, sc in ch3-sp, repeat from * to end, ending with an sc in the final st. Final R3: ch3, turn, 3dc in top of 1st dc, *ch1, sc in ch3-sp, ch1, (3dc, ch1, 3dc) in ch1-sp, repeat from * to end, ending with a (3dc, ch1, dc) in last of turning chains. Final R5: ch1, turn, sc in ch-sp, *ch1, (3dc, ch1, 3dc) in ch1-sp (between dc groups), ch1, sc in ch3-sp, repeat from * to end, ending with an sc in the final st. If your piece is the exact right size, fasten off with a long tail. Use the tail to sew the matching rows together. Weave in all ends. If your piece is a little small (like mine), do not fasten off. Ch 1 and turn, then sc evenly down the sides to add width. Do this until the piece is the right size. Then either seam together and add decorative buttons, or sc down the other side also and add button loops for a closure. 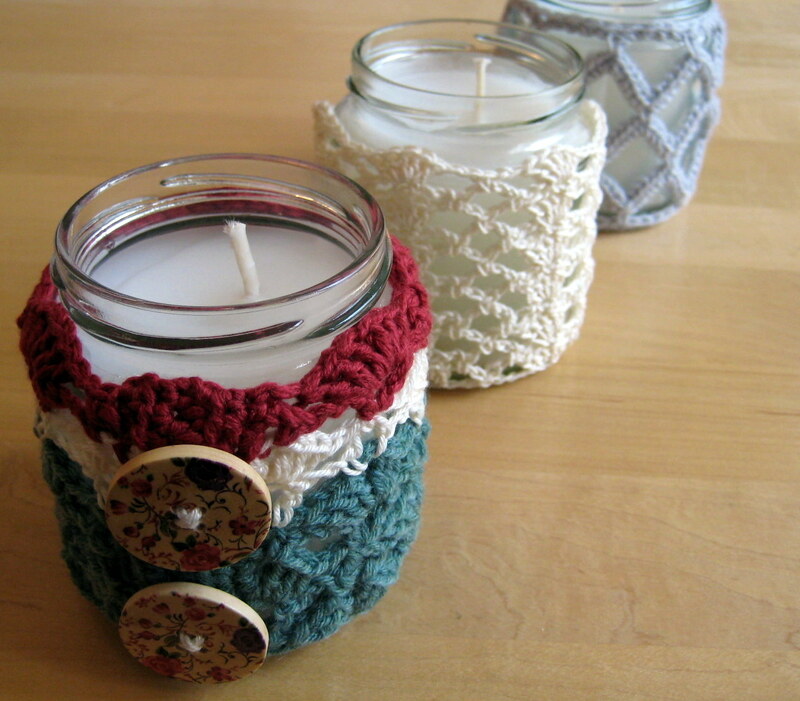 Turn to display just the crochet pattern, or the buttons if you prefer! 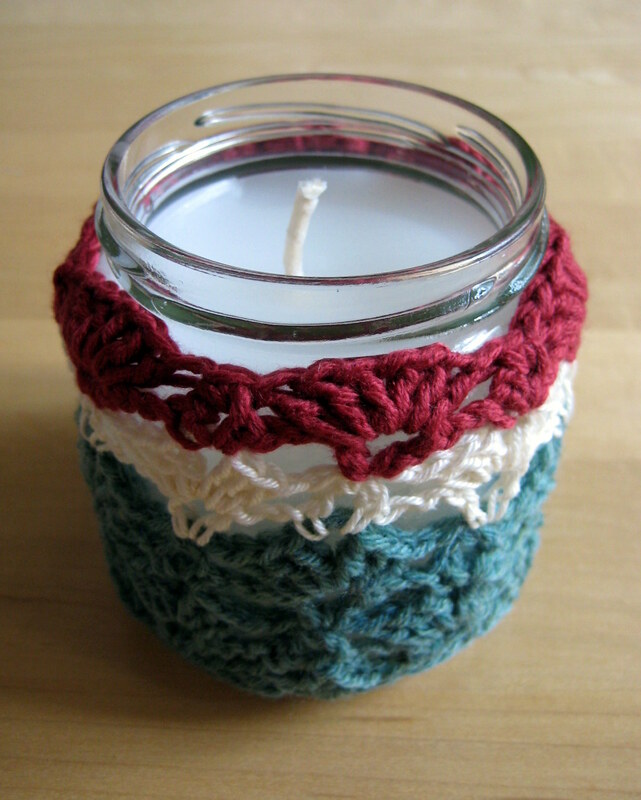 Make your crochet cover shorter than the lip of your jar, you do not want your yarn catching on fire! Buttons at the front… Can’t decide which I prefer!